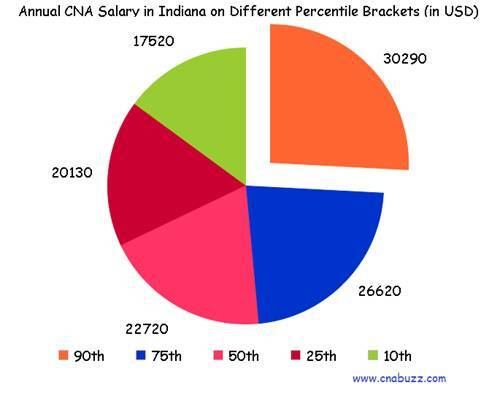 CNA Salary in Indiana fluctuates depending on a number of factors such as education, experience, and geographical location. Since, the cost of living in the state is low CNAs from other parts of the country prefer working in Indiana. As of May 2013, average CNA salary in the state was $23,390 per annum, according to the Bureau of Labor Statistics. This equals to $11.25 per hour. In the same year, the number of certified nursing assistants employed in Indiana was 31,940. Employment per 1,000 jobs was estimated to be around 11.19. According to December 2014 reports of indeed.com, the average income of CNA was $23,000 which was unfortunately 4% lower as compared to the average pay of CNAs at the national level. The table given below provides annual wage estimate of a certified nursing assistant based on different percentile brackets. 90% of CNAs waged less than $30,290; 10% were offered more than $30,290. 75% of employees earned less than $26,620; the remaining 25% earned more than $26,620. 50% made less than $22,720; the rest 50% paid more than $22,720. 25% of CNAs received annual wages less than $20,130; 75% were salaried more than $20,130. 10% of certified nurse assistants remunerated less than $17,520; 90% were offered more than $17,520. Each city in the state of Indiana has its respective salary, which depends on a number of factors like competition, employer, experience, population, location, etc. According to the statistics provided by salary.com, the highest paid cities in December 2014 were Gary and Hammond with median annual and hourly salary of $29,777 and $14, respectively. Lafayette was the lowest paying city with a median salary of $27,509 per year. There are a number of choices that a certified nursing assistant may choose in order to advance their career in the nursing industry. 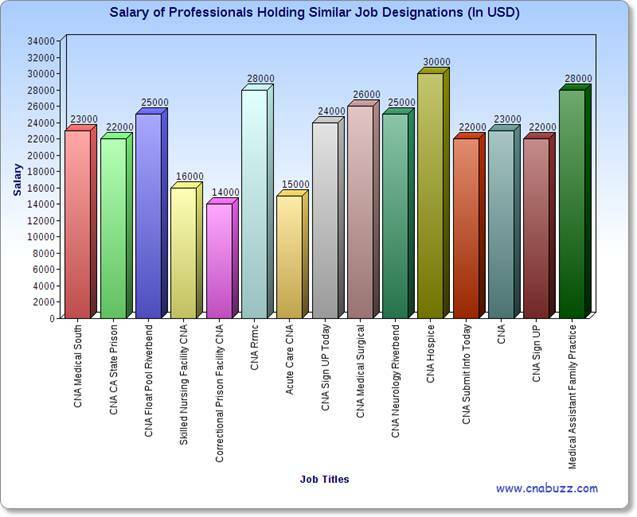 The salary range, basically, depends on the designation. The higher the ranking in the organization, the greater the salary package will be. The below given table indicates that CNA Hospice enjoyed an income of $30,000 per annum in December 2014. The least paid ($14,000) workers were Correctional Prison Facility CNAs. The salaries of other job titles ranged between $15,000 and $28,000. With the advancement in the nursing sector, aspirants employed in this field expect better opportunities in their career. According to the U.S. Bureau of Labor Statistics, the job vacancies for CNAs will increase by 21 percent in between 2012 and 2022. So, what you are waiting for? Just grab this opportunity by enrolling yourself for a CNA Program which must be approved by the state and obtain CNA certification, as soon as possible. Question 1 – Can anyone tell me the average pay of CNAs in the state? Answer – According to the data provided by indeed.com, CNAs earn an average salary of $23,000. Question 2 – I am presently doing my certification. Can anyone tell me the highest paying job title in the state? Answer – CNA Hospice made the highest income ($30,000) in December 2014.